Nomi is an architecture, design and fabrication studio. Our unique business model allows us to work at any scale; from urban design to product design and everything in between. 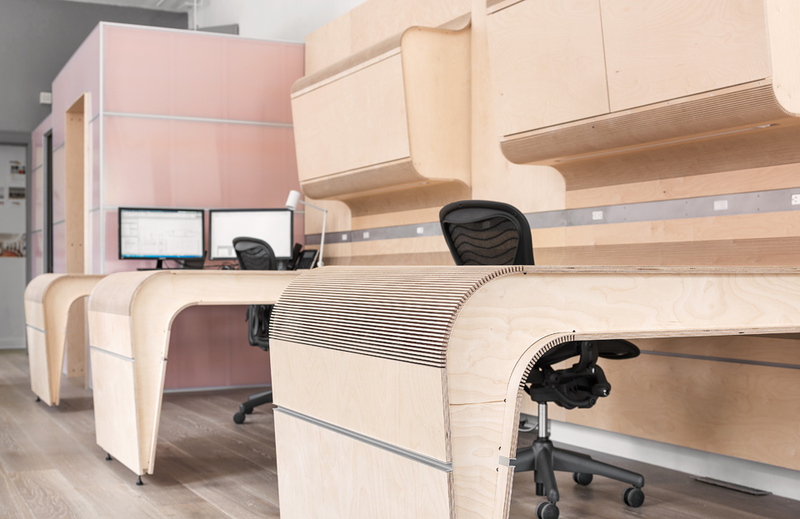 The Nomi Louisville office is a continuation of the research and development of work-space furniture design and fabrication taking place in our office and full workshop in Lexington, Kentucky. Using freeform 3D modelling software in conjunction with computer numerical controlled (CNC) fabrication processes we designed, built and installed our own dynamic, multi-dimensional work environment that blurs the distinction between vertical and horizontal, plane and mass. The custom shelving, conference table, desks, wall panels, movable wall system and service enclosure all designed, fabricated and installed by Nomi Design.